Lighting, since we have been introduced to the incandescent light bulb over 100 years ago, has been known as a fragile, fixed bulb that emits a bright light to its surroundings. When you think about it, not much is different from today’s LEDs, only the size has become much smaller. The “bulb” in an LED is still rigid, and still relatively fragile. As great as LEDs have become, we see a different future of light, the future where light can be applied to anything and everything. The future where lighting doesn’t have to make you squint or turn away, but to be taken in by its beauty. We are excited to introduce the new generation of lighting technologies; the generation of integrated light. The VynEL™ lighting generation. VynEL™ lighting system takes the traditional light bulb and squashes everything we know about it. 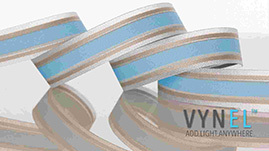 Rather than a rigid surface that is meant to be in a fixed position, VynEL™ lights are flexible, and encouraged to be moved. Rather than a single bright pinpoint of light, VynEL™ lighting’s evenly lit nature exudes a pleasant light to look at, which can be nearly any shape, size or color. Don’t even think about throwing an incandescent bulb in the washing machine... but VynEL™ lighting is made so you CAN wash it. Instead of a rigid, glass bulb, our newest iteration, VynEL™ Flow uses space age materials to provide bounce and stretch so it can be integrated into activewear and remain one with the clothing and comfortable to the user. These differences make VynEL™ Flow lighting system the true path towards an integrated future of light. We are currently looking to work with manufacturers in the following industries that share a vision for a greener and brighter future: outerwear, sporting goods, athleisure, bags, footwear, safety, helmets, board sports, water sports, automotive and aerospace. If you would like more information on the VynEL™ Flow lighting system, or have VynEL™ lighting specific questions, please call 877.615.6556 or email info@ellumiglow.com. Introducing: VynEL - The Most Versatile Light Ever!